This chart shows changes in CCSD school performance framework ratings from 2014 to 2016. At our board of education meeting last Monday director of instruction Adam Hartman shared exciting information about updated school and district accreditation ratings. Each year Colorado schools receive a school performance framework report establishing their accreditation status Based on student growth and achievement on state administered tests, these reports place schools in one of four categories, from performance (the highest rating a school can achieve) to improvement, then on to priority improvement and turnaround (the last two of which could lead to school reorganization if academic improvement is not displayed). This chart shows the progress CCSD has made toward full accreditation since 2011. Back then we were nearly 15 points on a 100 point scale from being accredited. This year we finally cleared the bar. This system of accreditation has been in place in Colorado since 2010. However, because of changes in the way Colorado measures student achievement and growth during the past several years, school and district accreditation ratings were not recalculated in 2015. Thus, our 2016 ratings have been much anticipated. At the meeting Mr. Hartman shared wonderful news in that McKinley Elementary School raised its accreditation rating from priority improvement to performance this year, while Cañon City Middle School increased its rating from improvement to performance. Other schools that displayed significant progress in their accreditation ratings include Cañon Exploratory School, Lincoln School of Science and Technology, and Mountain View Core Knowledge School. To better illustrate this, I have attached a graphic that shows the prior rating of each off our schools, as well as their recently updated ratings. 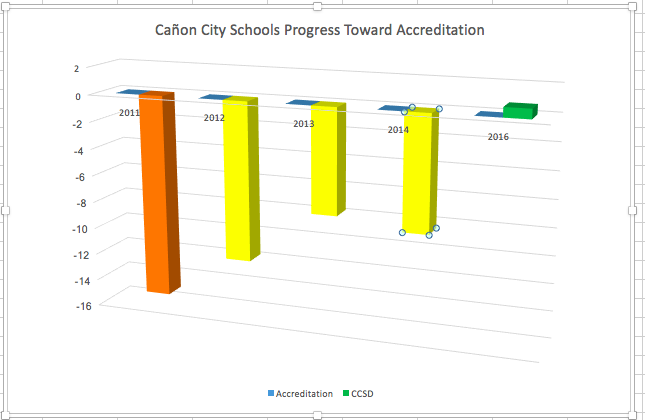 On the strength of this improvement at many of our school levels, Cañon City Schools also saw its district accreditation rating increase from improvement in 2014 to full accreditation in 2015. This is a truly significant development in light of our district having actually being on the state’s accreditation remediation clock as recently as 2011. I have attached a graphic showing the district’s progress related to acquiring full accreditation over the past several years. I also want to take a moment to congratulate our students and staff members for this outstanding accomplishment, for I know efforts to align curriculum to state standards and teach it effectively in every classroom were in progress long before I arrived in Cañon City. On Monday October 17th, thanks to participation by Cañon City High School National Honor Society members as well as a slew of teachers, support staff members, and administrators, the district conducted a drill to practice actually reunifying students with their parents in the event one of our schools would have to be evacuated for safety reasons. I want to thank director of student support services Paula Buser, CCHS assistant principal Toby Melster, CES principal Scott Morton, and operations manager Jeff Peterson for having the foresight to plan and conduct such an event on a non-school day to allow staff members time to practice these important procedures, and to reflect on them, in such a comprehensive manner. "Parents" wait in line to be reunited with their "children" at the district wide reunification drill. I started my week last Monday at an early morning meeting about implementation of technology devices at the Kindergarten level at Cañon Exploratory School. I also met with district literacy coordinator Gina Gallegos before also addressing some CCHS disciplinary issues in the afternoon. I ended Monday at a board work session and regular meeting. On Tuesday I attended Superintendent Advisory Council meeting and our monthly BSERT meeting. In the afternoon we had our monthly leadership team meeting, and then I touched base with our certified association leaders. On Wednesday I caught up on work in my office, and also had several parent meetings. On Thursday morning I met with a board member over breakfast, worked in my office, then travelled to Thornton to drop in on the Colorado Safe School Resource Center annual Safe Schools Conference. I spent Thursday evening in Fort Collins with board vice-president Lloyd Harwood before presenting two breakout sessions with him on the topic of how boards might best deal with crisis situations at the Colorado Association of School Board’s fall conference. Board of education vice-president Lloyd Harwood presents on how effective boards manage crisis situations at last week's Colorado Association of School Boards Fall Assembly. Though there is no school on Monday due to our end of quarter teacher flex-work day, many key district personnel will be participating in an early morning emergency reunification simulation. Throughout the rest of the day I have a series of meetings with parents and various staff members. There is no school once again on Tuesday as it is a district staff development day. On this day elementary teachers will have time to share successes and challenges related to the implementation of our new Journeys reading resources, while high school teachers will work on tasks related to the school's transformation to the pathways model. I’ll also have SAC, evaluation, and parent meetings on Tuesday. On Wednesday I’ll be in La Junta as a keynote speaker for a Healthy Eaters-Lifelong Movers (H.E.L.M) summit. I’ll share my experiences about how improvements in classroom instruction and greater effort expended toward the health and wellness of children can lead to advancement of school and district accreditation status. On Thursday and Friday I will spend extensive time working on a project for the Colorado Association of Senior School Administrators. Thanks for listening once again!